When we were headed out to Glacier National Park, we had high hopes to visit Grinnell Glacier. This glacier has been shrinking but is one of the most accessible in the park (at least when snow isn't covering the trail). Buuuuut, we visited in late June and the trails were not clear. Nonetheless, we spent several delightful hikes wandering to and around the lake that the glacier feeds (Grinnell Lake) and hiking up toward the glacier to enjoy other views of the lake. The hike out to Grinnell Lake goes around Swiftcurrent Lake and Lake Josephine. These lakes feel like the most beautiful thing you will ever see in your entire life. The waters are somehow blue and clear at the same time and the air was so crisp and fresh. 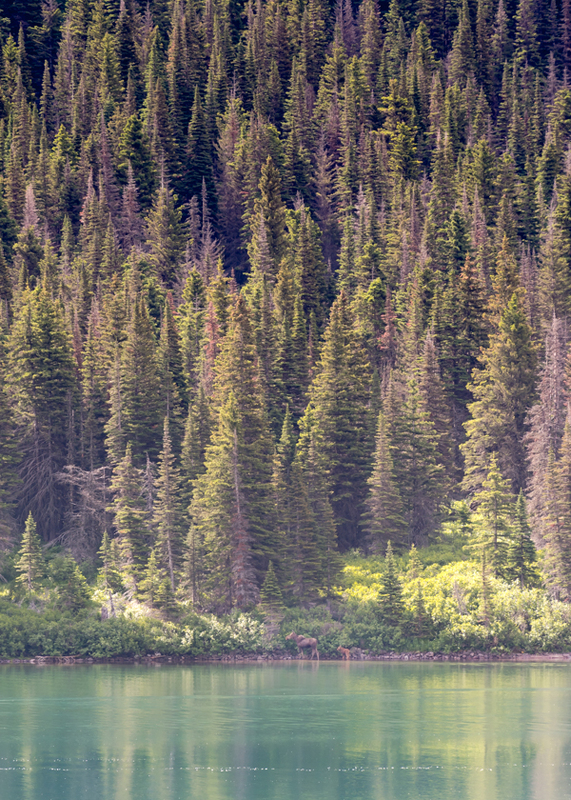 As we walked around one lake, we saw a mother moose and calf wading in the waters across the lake. Along the hike, you can take a short (but steep) side trail up to view Hidden Falls. 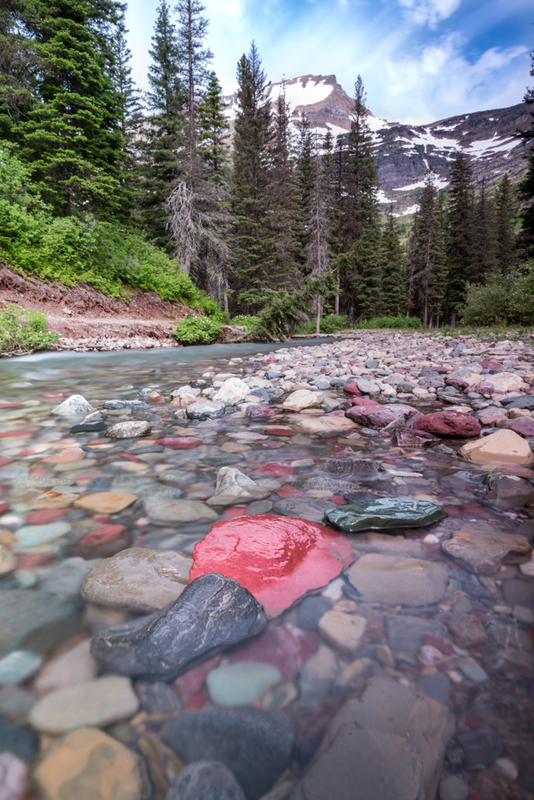 Then you'll cross a long footbridge over Cataract Creek, which is full of red, green, and gray stones that bring even more life to an already beautiful place. You can make the hike shorter by turning around early, but from Swiftcurrent to Grinnell Lake and back is only 6.2 miles so we suggest the whole thing. There are options to take a boat trip across Swiftcurrent or Josephine Lake to make the hike shorter if desired. If you are headed to Grinnell Glacier (~11 miles round trip), you'll get a stunning view of Grinnell Lake from above. As I mentioned, the trail to the glacier was closed to hikers when we visited. The wildflowers and views made it worth the trip up even if we couldn't get all the way to the end. Because of the way we wandered around the trails here, it's hard to be sure exactly how far we hiked in the Grinnell complex. Whether you take the easy hike out to Grinnnell Lake or the more strenuous hike up to Grinnell Glacier (or both), you will be rewarded with some of the most amazing Montana scenery. Pro Tip: the Swiftcurrent Motor Inn just up the street from this trailhead has amazing cheese sticks and other tasty food, perfect for a mid day meal to fuel you up for a second hike in the area.